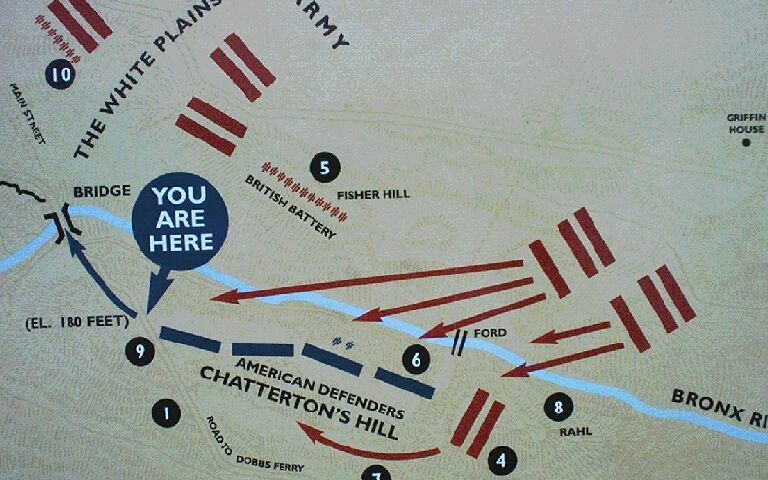 The British crossed the Bronx River and advanced on Chatterton's Hill, under the command Brigadier General Lesilie, with the 5th, 28th, 35th, and 49th British Infantry Regiments, the British 17th Light Dragoons, the Hesse-Cassel Regiment von Lossberg, and some Hessian Grenadier battalions, including one from the Hesse-Cassel Regiment von Donop, which were supported by 20 British artillery pieces. 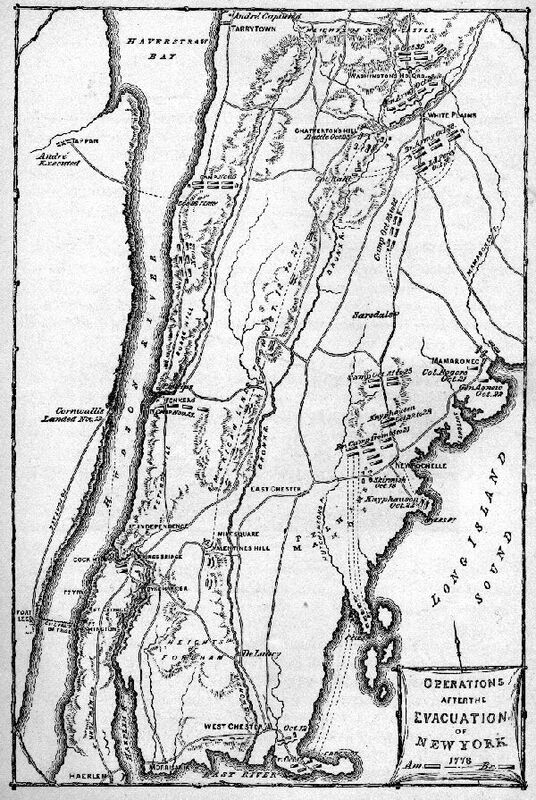 The American troops, under the command of Brigadier General Alexander McDougall, consisted of Continental regiments from Connecticut, Delaware, Maryland, and New York, and Militia regiments from Connecticut, Massachusetts, New Jersey, and New York. 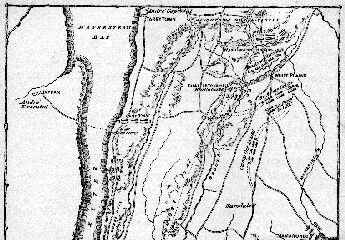 The battle began with a British artillery barrage that lasted about an hour, after which the British attempted to take Chatterton's Hill from the front of the American line, while the Hessians moved on the American right flank, which was on a less steep part of the hill. 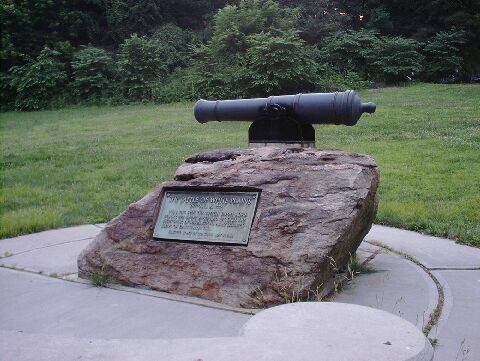 The Hessians advanced under artillery fire from the 2 guns of the American New York Colony Artillery Company, which was commanded by Captain Alexander Hamilton, and on their third attempt, the Americans were outflanked, on their right flank, by the Hessian troops, under the command of Colonel Johann Gottlieb Rall, and were forced to retreat down Dobbs Ferry Road (now Battle Avenue) to Dusenburry Hill. 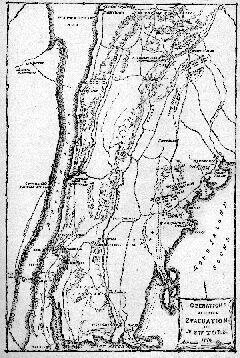 A map of the area around White Plains, from Charles Coffin's The Boys of '76, which was published in 1876. 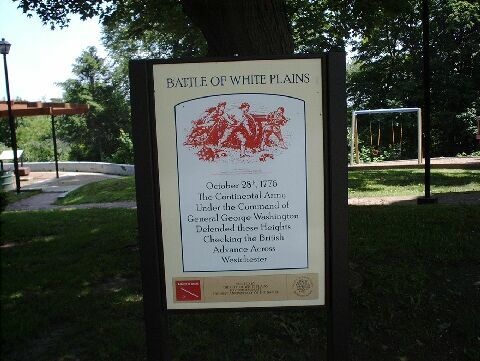 The top part of the map, on the left, showing the deployments for the Battle of White Plains. 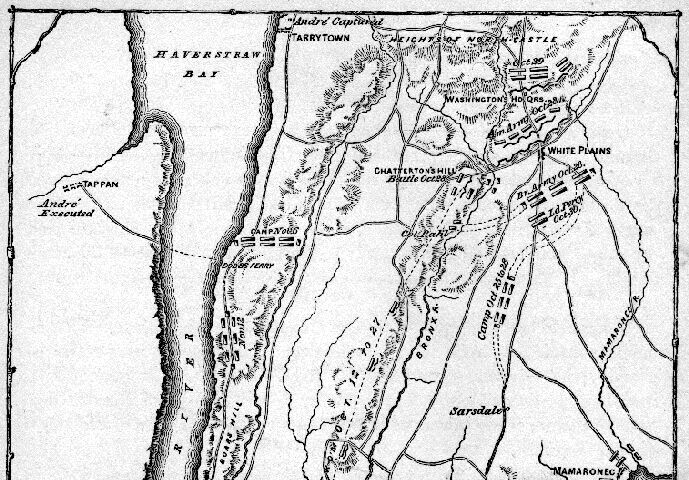 A map of the Battle of White Plains that is on display at the battlefield. British General Sir William Howe had made his headquarters at Griffin House, on Mamaroneck Road, in Scarsdale. 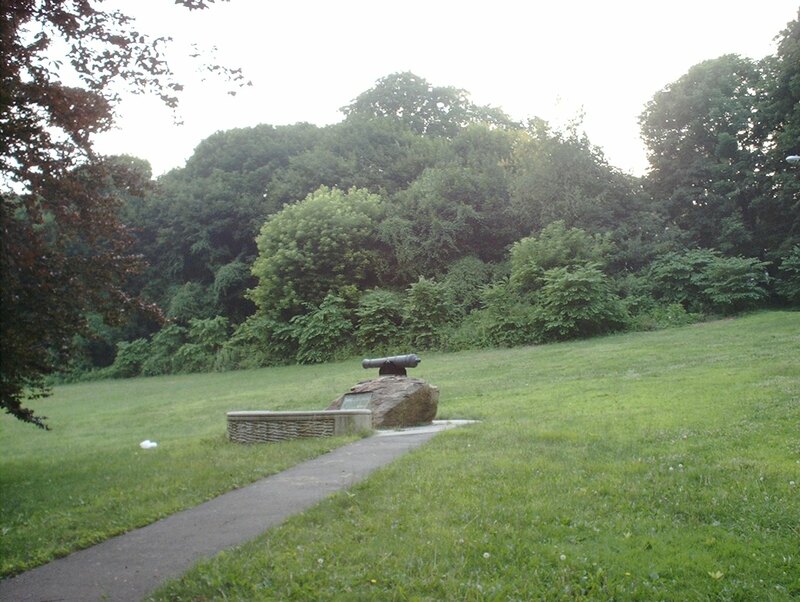 The monument, near the bottom of Dobbs Ferry Road, that marks the area where the British forded the Bronx River to attack the American line. 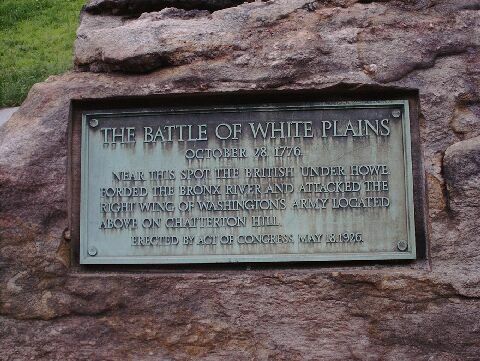 The plaque on the monument that is near the bottom of Dobbs Ferry Road. 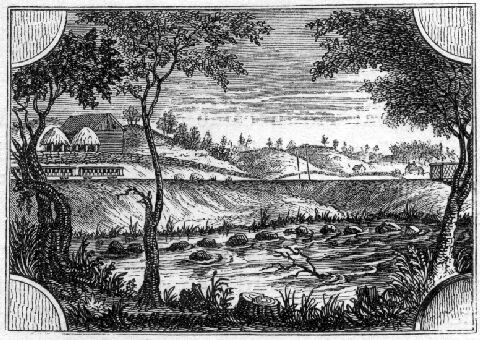 A picture of where the British crossed the Bronx River, from Charles Coffin's The Boys of '76, which was published in 1876. 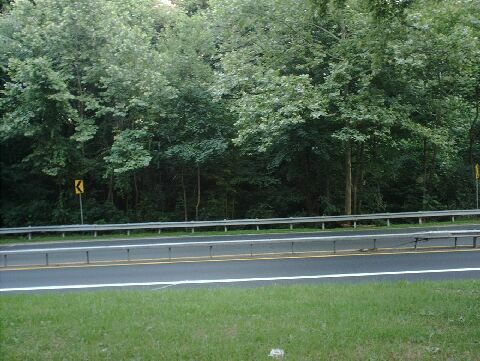 A view looking towards the Bronx River, near the ford that the British had crossed. 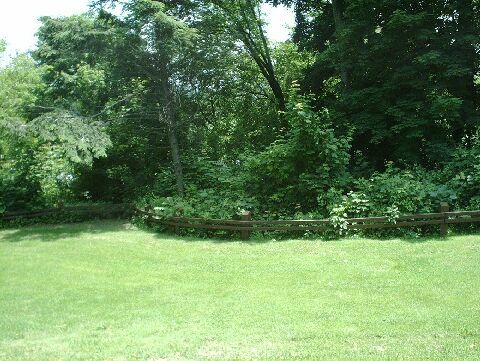 A view looking towards the center of the American line on Chatterton's Hill, from near the ford that the British had used to cross the Bronx River. The view towards the British artillery position, as viewed from the American left flank. The hill that the artillery was on is now obscured by trees. Captain Alexander Hamilton, the commander of the American New York Colony Artillery Company on Chatterton's Hill, who also fought at the battles of Long Island, Trenton, Princeton, and Yorktown. 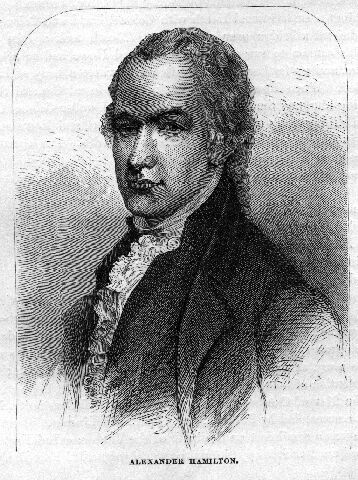 He was born on January 11, 1755, attended King's College, which is now Columbia University, in New York City, was part of the Constitutional Convention, authored 51 of the 85 essays of "The Federalist", was the Secretary of the Treasury, under President George Washington, a leader of the Federalist Party, and was killed by Aaron Burr in a duel, on July 11, 1804.